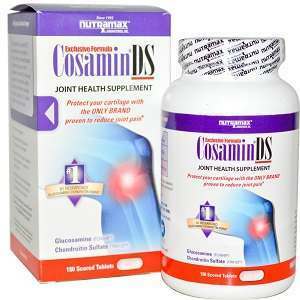 Cosamin® DS Joint Healthy Supplement is advertised by its manufacturer as being the most research product combining the powerful effects of glucosamine and chondroitin. The supplement is on the market since 1992, and it is sold through all the important retailers. Enjoying a lot of positive feedback, Cosamin® DS Joint Healthy Supplement seems to be a very reliable product, although its list of ingredients is less impressive than what newer supplements contain today. In case you are looking for a well tried and tested formula, this is the type of product you may be interested in learning more about. Read our review so you can make an informed decision on the matter. What Does Cosamin® DS Joint Healthy Supplement Contain? The high content of glucosamine and chondroitin recommends this product. With the most potent compounds that were clinically tested in its formula, Cosamin® DS Joint Healthy Supplement is a good recommendation. However, we cannot help but notice that the recipe does not contain MSM, another ingredient that increases the effects of glucosamine, nor hyaluronic acid, another important compound with benefits for achingjoints. In order to enjoy the best effects of this supplement, you need to take three capsules daily. You can take them all at one time, or throughout the day, with your meals. The listing price for a bottle with 210 capsules is 124.99USD, which is a bit on the steep side, even if one bottle lasts for 70 days. There is no clear guarantee offered on the official website of the manufacturer, and, since the product is sold through retailers, it is expected to have to appeal to their policies for getting refunds. Cosamin® DS Joint Healthy Supplement enjoys a positive reputation built throughout the years, since the product was first released on the market in 1992. Containing two of the most potent ingredients for joint health, glucosamine and chondroitin, this is a product that anyone can recommend. However, we saw no inclusion of MSM, hyaluronic acid and herbal remedies that are recently included in new formulas for joint health. Mark Stevens	reviewed Cosamin DS	on December 25th	 and gave it a rating of 2.